Hundreds of students have already signed up to take a class in Fall 2012. Are you one of them? Don’t forget that August 6th is the scholarship and financial aid deadline. With classes less than two months away, there’s no time like the present to fulfill your dreams with NLC like Sarah Gray of Machinists Local Lodge 2339H. Sarah’s love of travel propelled her into a career in the sky, but the flight attendant traded her travel guidebooks for textbooks when she enrolled at NLC – and she couldn’t be happier. “I used to just know about my job and my local union. 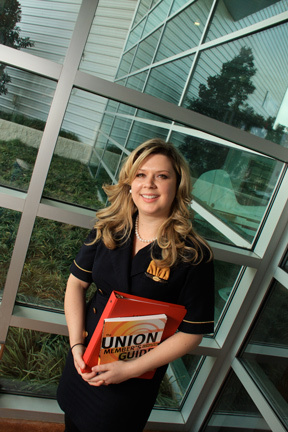 Now, I’m learning so much about the labor movement, and I feel that it will really help me not only in my job, but also in my ability to communicate with other union members,” says Sarah. The Dallas, TX, native is proud to be the first in her family to graduate college. Sarah said that from the very start, it was obvious to her that the school wants the students there to succeed. The whole experience has been wonderful. Everything has gone so smoothly. The professors, counselors, financial aid staff have all been great. It’s definitely a different experience than I have encountered elsewhere. And to help make going back to school more affordable, she was able to tap into a Union Plus Scholarship to help. Scholarships for the Fall semester are available to help your dreams of completing a degree come true. Make sure you apply by August 6th to qualify for federal financial aid and scholarships.